This is a guest post by Kathryn Vercillo, author of Crochet Saved My Life and blogger at Crochet Concupiscence. She has created a new survey to explore the healing aspects of crochet. Have you seen all of the research lately pointing to the fact that crochet heals people? Studies show that crafts including knitting and crochet likely have a number of health benefits. The most commonly cited benefit is relief from depression, but crafting helps with many other mental health and physical health issues as well. We’ve just begun to explore the tip of the iceberg when it comes to how crochet helps people. A new survey has been launched to help dig deeper. * What symptoms of mental and physical illness are people relieving with crochet? * How much is crochet really helping people with these symptoms? * What other benefits does crochet offer besides symptom relief? * How do the benefits of crochet compare to the benefits of other similar crafts? There are many important reasons to study this topic. First off, there are tens of thousands of people out there crocheting and it can help each and every one of them to know about the different ways that the craft can help them. There are also plenty of people struggling with health issues who might be encouraged to try to crochet to heal if they can see how it might help. And there are a variety of institutions and healing centers (hospitals, therapy groups, schools, etc.) 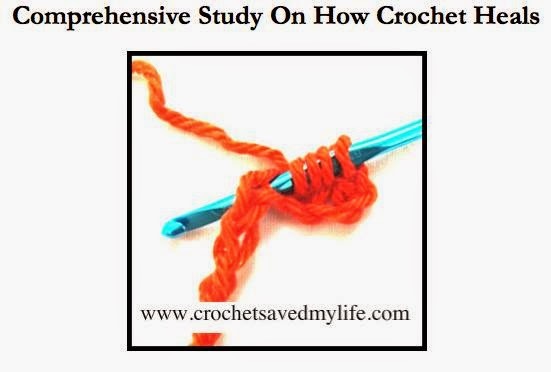 that might be interested in launching crochet programs if the study can show that the craft helps to heal people. The research from this study has the potential to create a great ripple effect. And you can help just by taking the survey and spreading the word about it to others. Please consider taking the survey now. Or you can learn more about it from this press release. Thank you so much, Kathryn! It is an honor to have you guest post here! I took the survey and it was a wonderful opportunity to "tell my story" about how crochet has healed me. Go on folks...tell your story. | On the Board | -- Instead of being "thankful for things" we should focus on being "thankful in our circumstances", whatever they may be. Thanks so much for allowing me to reach your readers with this guest post. I have been so inspired already by the responses people are sharing in the survey and look forward to providing more information to everyone about how crochet heals when the results are complete. I so appreciate your support! Thanks so much for sharing this information. Crocheting has helped me out for the past few years. Crocheting is serious therapy for me and so many others! Happy to hear it has helped you! It is such a cathartic craft, I think. Good to hear it is helping you heal! Keep on hooking, I say!